When I first started running, I never thought that it would take over my life the way that it has. I was just running to try to get over a weight loss plateau. I never dreamed that it would help fill a void in my life and that I would start to feel like an “athlete”. I was always the fat girl that was horrible at sports and the last kid ever chosen to be on someone’s team. Running changed all of that! Despite not being the fastest or most skilled runner, I finally found a team where I belong. My running milestones began with Rock the Parkway 5K in April 2011. It wasn’t the best time, but I did it!!! I felt awesome and definitely had a high from my accomplishment. The next race I did was the Weight Watcher’s Walk It Challenge in May 2011. I walked most of the race with my mom and a fellow Weight Watcher member. I don’t know how long it took us to finish, but time didn’t matter. I had inspired my mom and a friend to participate in a 5K. In June 2011, I started attending KCTC’s Beginners Running Group at Gary Gribbles in Ward Parkway Center. I met so many great people during those classes and have remained friends with several of them. 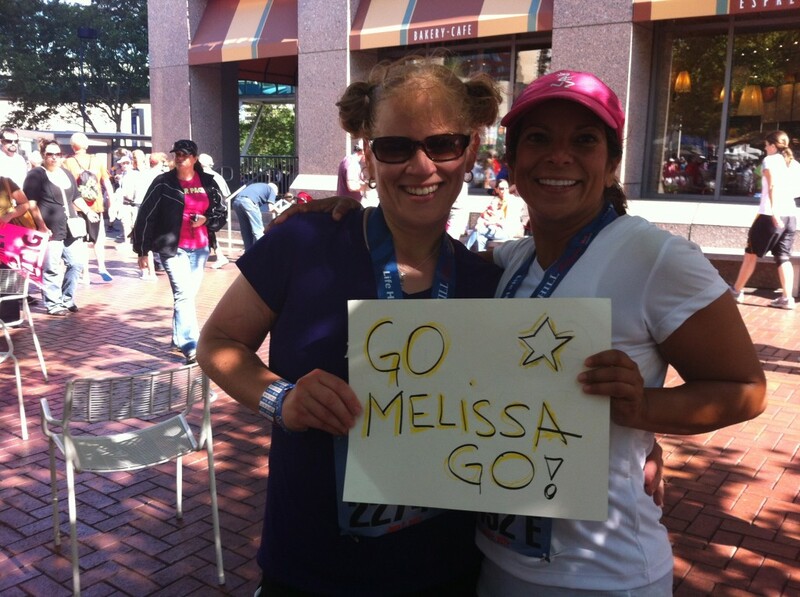 I went on to run the Komen race in August 2011 and decreased my 5K time. In October 2011, I ran my first half marathon (Waddell and Reed Kansas City Half Marathon). I finished in 2 hours and 24 minutes and was so excited. In November 2011, I helped start the running group in Liberty. This group means the world to me and they have helped make me the runner I am today. We met every Saturday during the winter and they pushed me to continue to improve my speed, distance and endurance. When spring arrived, I became a KCTC Ambassador and I started running races again. In March 2012, I traveled to Atlanta to run the Publix Georgia Half Marathon. Despite some stomach cramps and the unseasonable warm weather, I finished in 2 hours and 29 minutes. It was worse than my first time, but considering the circumstances, I was happy with my time. Two weeks later, I braved the heat and humidity again to run my 4 mile leg of the Brew to Brew race. Two weeks after that, I ran Rock the Parkway again. This time, I ran the half marathon. I finished in 2 hours and 27 minutes. I was disappointed in my time, but I was still proud of my accomplishment. I didn’t give up and two weeks later came a great victory for me. I ran in the rain during the Sabates Trolley Run and finished in 39 minutes. This was the fastest that I had ever run 4 miles. My confidence and enthusiasm were restored. I continued to train and decided to run the Hospital Hill Half Marathon. I was scared of the hills and decided that my goal was to just finish and survive the race. My friend and I lined up in the 2:20 pace group the morning of the race. I figured I wouldn’t be able to keep up, but I would be ambitious and at least try. Then the race started and I took off running. I couldn’t believe how great I felt and how I my body just took over. Before I knew it, I had left that pace group behind and was in front of the 2:15 pace group. About halfway through the race, I started to slow down a little and had to find other ways to stay focused and motivated. There were a couple of runners who saw me walking and they encouraged me to continue running. For the rest of the race, we took turns passing each other. They kept me from giving up and I was able to finish in 2 hours 18 minutes. That was 6 minutes better than my fastest half marathon time and 11 minutes better than my Atlanta time. I never found out their names, but I saw them after the race and thanked them for their help. I had accomplished a new personal record at a race that I just wanted to survive. I wasn’t the only one who had a huge milestone reached that day. Four of the six members of the Liberty running group got new personal records that day and three of the six placed within their age group. We definitely conquered those hills! This post was written by ambassador Melissa West. She helps lead the Running Group in Liberty on Saturday mornings and often helps with the Beginners Running Group on Monday nights.